Inquire: Why Were the Participants in the Civil War So Passionate? Soldiers need a reason to fight, to commit, to sacrifice — to die. These motivations were on full display during the Civil War. This was a conflict wherein both sides were extremely passionate and committed to the righteousness of their cause. Like most wars, the war lasted longer and was more destructive than anyone anticipated, as it became the first “total war” in U.S. history — a war that involved all the resources and all the people in the country or countries involved. The devastation was more widespread than anyone could possibly have imagined, and more men died in this war than all other U.S. wars combined. President Lincoln manipulated the South into starting the war, the border states had to choose sides, and the resolve and beliefs of both sides were pushed to the limit. It was no game — it was the Civil War. After secession by the South, how did the Civil War begin? In 1861, enthusiasm for war ran high on both sides. Southern legalists pointed to the founding fathers’ intent and the Constitution to support their rights as states. The Confederacy, which by the summer of 1861 consisted of 11 states, fought for its independence from the United States. The continuation of slavery was a central issue in the war, of course, although abolitionism and western expansion also played roles. While in the North the Southern secession was seen as a betrayal. The North fought to restore the Union, which Lincoln declared could never be broken. Northerners and Southerners alike flocked eagerly to the conflict. Both sides thought it would be over quickly. Militarily, however, the North and South were more equally matched than Lincoln had realized, and it soon became clear that the war effort would be neither brief nor painless. In 1861, Americans in both the North and South romanticized war as noble and positive. Soon the carnage and slaughter would awaken them to the horrors of war. After the fall of Fort Sumter on April 15, 1861, Lincoln called for 75,000 volunteers from state militias to join federal forces — with a 90 day enlistment. Lincoln believed the war would be short; a 90-day campaign would be sufficient to put down the Southern rebellion. The response from state militias was overwhelming, and the number of Northern troops exceeded the requisition. Also in April, Lincoln put in place a naval blockade of the South, a move that gave tacit recognition of the Confederacy while providing a legal excuse for the British and the French to trade with Southerners. The Confederacy responded to the blockade by declaring that a state of war existed with the United States. This official pronouncement confirmed the beginning of the Civil War. Men rushed to enlist, and the Confederacy turned away tens of thousands who hoped to defend the new nation. When the Confederacy moved its capital to Richmond, Virginia, 100 miles from Washington, everyone expected a decisive battle to take place on the ground between the two cities. Many believed that a single, heroic battle would decide the contest. Some questioned how committed Southerners really were to their cause. Northerners hoped that most Southerners would not actually fire on the American flag. Meanwhile, Lincoln and military leaders in the North hoped a quick blow to the South, especially if they could capture the Confederacy’s new capital at Richmond, would end the rebellion before it went any further. On July 21, 1861, the two armies met near Manassas, Virginia, along Bull Run Creek, only 30 miles from Washington D.C. 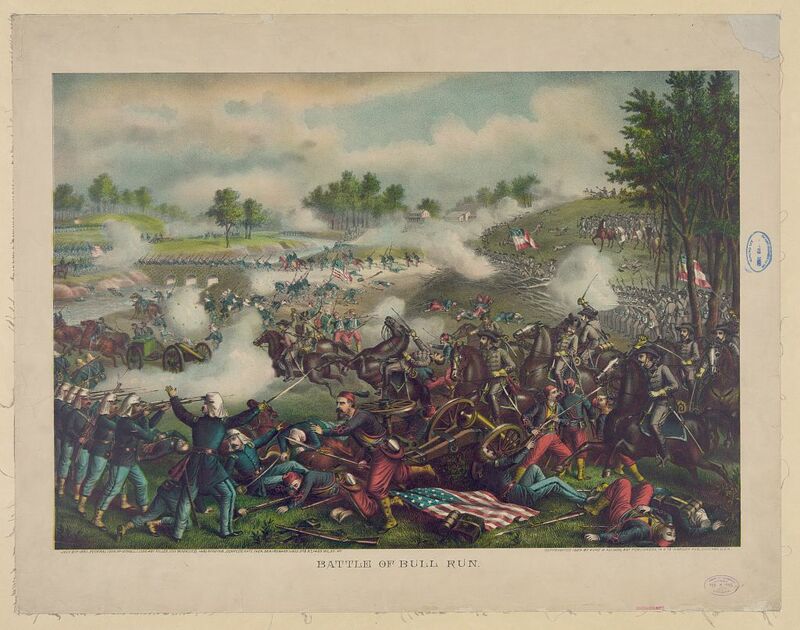 The first major battle of the Civil War is known by two names: the Battle of Bull Run, or the Battle of Manassas Junction (just the “Battle of Manassas”). Frequently, major battles had two names. The South named battles after the nearby cities. The North named them after the nearby waterways. In the spring of 1861, 35,000 Confederate troops led by General Pierre Beauregard moved north to protect Richmond against invasion. Lincoln’s army had almost completed its 90-day enlistment requirement and still its field commander, General Irvin Mcdowell, did not want to fight. Pressured to act, on July 18 (three months after the war had begun) McDowell marched his army of 37,000 into Virginia. It took the Northern troops two and a half days to march 25 miles. Beauregard was warned of McDowell’s troop movement by a Southern belle who concealed the message in her hair. He consolidated his forces along the south bank of Bull Run, a river a few miles north of Manassas Junction, and waited for the Union troops to arrive. So great was the belief that this would be a climactic Union victory that Washington socialites and politicians came in carriages or on horseback, many bringing picnic lunches to a nearby area. Together with reporters from all over the U.S., they gathered hoping to witness history unfold before them, to see a real battle. The First Battle of Bull Run, which many Northerners thought would put a quick and decisive end to the South’s rebellion, ended with a Confederate victory. Early on July 21, the First Battle of Bull Run/Manassas began. During the first two hours of battle, 4,500 Confederates gave ground grudgingly to 10,000 Union soldiers. But, as the Confederates were retreating, they encountered a brigade of fresh troops led by Thomas Jackson waiting just over the crest of the hill. Trying to rally his infantry, General Bernard Bee of South Carolina shouted, “Look, there is Jackson with his Virginians, standing like a stone wall!” The Southern troops held firm, and Jackson’s nickname, “Stonewall,” was born. During the afternoon, thousands of additional Confederate troops arrived by horse and by train. The Union troops had been fighting in intense heat, many for 14 hours. By late in the day, they were feeling the effects of their efforts. At about 4:00 p.m., when Beauregard ordered a massive counterattack, Stonewall Jackson urged his soldiers to “yell like furies.” The rebel yell became a hallmark of the Confederate Army. The Union retreat became a rout. The Confederate forces carried the day, sending the Union soldiers and Washington D.C. onlookers scrambling back from Virginia. Over 4,800 soldiers were killed, wounded, or listed as missing from both armies in the battle. The next day, Lincoln named Major General George B. Mcclellan to command the new Army of the Potomac and signed legislation for the enlistment of one million troops to last three years. Gone were the Union hopes of a quick, decisive victory. Instead, the war would drag on for four long, deadly years. The high esprit de corps of the Confederates was elevated by their victory. For the North, which had supremacy in numbers, it increased their caution. Seven long months passed before McClellan agreed to fight. Meanwhile, Lincoln had grew impatient at the timidity of his generals. In many ways, the Civil War represented a transition from the old style of fighting to the new style. During Bull Run and other early engagements, traditional uniformed lines of troops faced off, each trying to outflank the other. As the war progressed, new weapons and tactics changed warfare forever. There were no civilian spectators during the destructive battles to come. The Civil War was fought over conflicting goals and conflicting beliefs. While it may seem difficult to understand the Southerners’ belief that their pro-slavery position was morally superior, both the North and South felt they were morally justified. In a war, can passion overcome politics? Can a committed, smaller country or force with a strong belief system defeat a vastly superior military foe? Yes, a committed, believing smaller country or force can defeat a vastly superior military foe. No, a committed, believing smaller country or force cannot defeat a vastly superior military foe. As it became increasingly clear that the Union would not be dealing with an easy rebellion, the two sides assessed their strengths and weaknesses. At the onset of the war, in 1861 and 1862, they stood as relatively equal combatants. The Confederates had the advantage of being able to wage a defensive war, rather than an offensive one. They had to protect and preserve their new boundaries, but they did not have to be the aggressors against the Union. The war would be fought primarily in the South, which gave the Confederates home field advantage; they had knowledge of the terrain and support of the civilian population. Further, the vast coastline from Texas to Virginia offered ample opportunities to evade the Union blockade. And with the addition of the Upper South states, especially Virginia, North Carolina, Tennessee, and Arkansas, the Confederacy gained a much larger share of natural resources and industrial might than the Deep South states otherwise could muster. Still, the Confederacy had disadvantages. The South’s economy depended heavily on the export of cotton, but with the naval blockade, the flow of cotton to England — the region’s primary importer had ended. England ceased buying Southern cotton in order to avoid conflict with the Union. They feared a potential invasion of Canada and the Union was also Britain’s major source of grain. The blockade also made it difficult to import manufactured goods. Although the secession of the Upper South added some industrial assets to the Confederacy, overall, the South lacked substantive industry or an extensive railroad infrastructure to move men and supplies. To deal with the lack of commerce and the resulting lack of funds, the Confederate government began printing paper money, leading to runaway inflation. The Confederacy started printing paper money at an accelerated rate, causing runaway inflation and an economy in which formerly well-off people were unable to purchase food. The advantage that came from fighting on home territory quickly turned to a disadvantage when Confederate armies were defeated and Union forces destroyed Southern farms and towns, forcing Southern civilians to take to the road as refugees. Finally, the population of the South stood at fewer than nine million people, of whom nearly four million were black slaves, compared to over 20 million residents in the North. These limited numbers became a major factor as the war dragged on and the death toll rose. The Union side boasted many advantages as well. Its larger population, bolstered by continued immigration from Europe throughout the 1860s, gave it greater manpower reserves to draw upon. The North’s greater industrial capabilities and extensive railroad grid facilitated mobilizing men and supplies for the war effort. The Industrial Revolution and the Transportation Revolution, beginning in the 1820s and continuing over the next several decades, had transformed the North. Throughout the war, the North was able to produce more war materials and move goods more quickly than the South. Furthermore, the farms of New England, the Mid-Atlantic, the Old Northwest, and the prairie states supplied Northern civilians and Union troops with abundant food throughout the war. Food shortages and hungry civilians, uncommon in the North, were common in the South, where the best land was devoted to raising cotton. Unlike the South, which could hunker down to defend itself and needed to maintain relatively short supply lines, the North had to go forth and conquer. Union armies had to establish long supply lines, and Union soldiers had to fight on unfamiliar ground and contend with a hostile civilian population off the battlefield. In short, although it had better resources and a larger population, the Union faced a daunting task against the well-positioned Confederacy. When the war began, many key questions were still unanswered. What if the slave states of Maryland, Kentucky, Missouri, and Delaware join the Confederacy? What if Britain or France come to the aid of the South? What if a few decisive early Confederate victories turn Northern public opinion against the war? Indeed, the North looked much better on paper. But, many factors, unforseen at the war’s outbreak, could have tilted the balance sheet toward a different outcome. Nonetheless, like many if not most wars in history, as the Civil War dragged on, it became a war of attrition, dependent on which side could afford to lose the most men and which side could replace the resources. The South simply did not have the resources, human or otherwise, to win the war. The longer the war dragged on, the more certain the South’s defeat became. The Battle of Bull Run was a victory for the Union. Southern legalist tried to defend their rights as they saw them outlined in the United States Constitution. Which of the following was a strength of the confederacy? the Union fighting force outside of Washington D.C.